Mmmm! 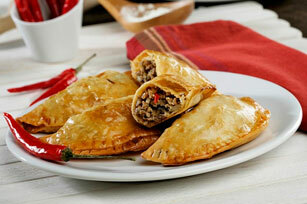 Flaky dough, savoury sausage and tender onions - a delicious empanada recipe that's easy to make. Who doesn’t love an empanada, fresh from the oven? Try them as an appetizer - if you can bring yourself to share! Beat cream cheese and butter in large bowl with mixer until well blended. Gradually beat in flour. Shape into ball. Wrap in plastic wrap; let stand 1 hour. Meanwhile, cook chorizo and onions in large saucepan on medium-high heat 9 to10 min. or until meat is done, stirring frequently. Remove from heat. Cool completely. Roll out pastry dough on lightly floured surface to 1/8-inch thickness. Use 4-inch cookie or biscuit cutter to cut pastry into 24 rounds, rerolling scraps as necessary. Discard any remaining dough. This is a great make-ahead recipe. Assemble empanadas as directed; place on baking sheet and brush with egg as directed. Freeze until solid, then transfer to freezer-weight resealable plastic bag or freezer container. Freeze up to 3 months. When ready to serve, place desired number of empanadas on baking sheet. Let stand at room temperature 1 hour; bake as directed. Love spice? Finely mince 3 birds-eye chilies and add to meat mixture for some added punch!